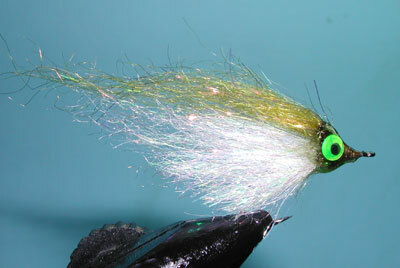 Notes: The Perfection perch is a modification of the Diamond Hair Minnow created by John Rohmer of Arizona Flyfishing in Tempe, AZ. The Troutfitter of Mammoth Lakes requested Solitude Fly Company to provide them with the Perfection Perch flies using the same materials as the Diamond Hair Minnow but altering the pattern as to hide the hook. 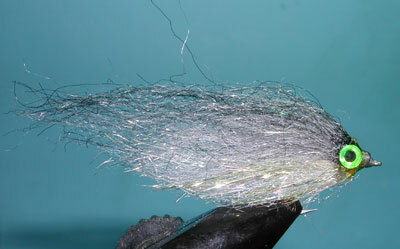 Diamond Hair and Minnow Hair can be obtained directly from Arizona Flyfishing. It is a material that is a blend of both mylar and nylon fibers, available in 18 colors. The material has exceptional movement and durability. Arizona Minnow Hair is a blend of synthetic and natural fibers. Arizona Flyfishing uses a Gamakatsu SC15 hook in sizes #1/0 - #2 and Solitude uses a Gamakatsu SC15 hook in sizes #4-6. The SC15 hook is a wide gap saltwater hook that is tin plated. I am using a Partridge GRS15ST Klinkhamer Hook which is very close to the same design but has a thinner wire with a nickle finish. The pattern is basically a brushed hair body streamer in which the fibers are brushed out with a comb or wire brush and trimmed to a baitfish profile. There are many materials, both natural and synthetic which can be used to create very good baitfish patterns. Colorations can be chosen to represent Shad, Rainbow Fry, Redside Fry, Golden and Silver MInnows. 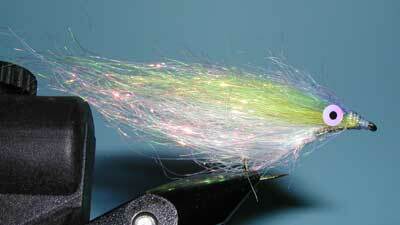 One pattern that was introduced to me in 2003 was the Awesome Shad designed by Don Ordes and Mike Martinek. This pattern uses a material called Awesome Hair that is composed of varying widths of mylar with holographic qualities, similar to Diamond Hair but does not contain the nylon fibers. Be aware that some head cements will melt these synthetic fibers. When attaching eyes or finishing the head use either epoxy or Sally's Hard as Nails acrylic.